To take advantage of true transportation management solutions, you need access to reports that provide you various ways to analyze your bus routing data. That’s why BusBoss offers access to over 100 built-in reports as well as a Report Generator that allows you to create and save unlimited custom reports. Credit card-style bus passes and post cards may be generated to inform parents of their child’s transportation information. Bus passes are also easily integrated with a student tracking system to ensure accurate transportation attendance. The BusBoss transportation management system delivers accurate state reporting to ensure maximum state funding reimbursements. Monthly, quarterly and annual state reports may be generated from within BusBoss to eliminate the need for manual reporting. Please click here for more information on Pennsylvania Reports or New Jersey Reports. The Report Generator is capable of multi-level sorts (by school, grade, name, etc.). It also allows you to define filters for searching complex information. User-defined report formats may be saved to a “report title” to be recalled for future use without reentering all filters and conditions for the search or sort. In addition to the built-in reports, your bus routing data is also accessible by standard third-party report generators through ODBC links. BusBoss generates mailing labels and postcards, and also allows you to create mail merge documents using your bus routing data for generating custom letters, labels and more. BusBoss allows you to take a “snapshot” of your student and bus routing data and save it to a history database. When you make changes to student and route data, the original information is not affected. BusBoss is the only transportation management system that allows you to save as many days to your history database as you like. This historical data may be used to calculate state reports for saved days of the month, which then automatically generate state report data that’s easily uploaded to the appropriate state website. Accurate historical reports are also helpful if you get audited. The BusBoss transportation management system is able to print maps with school zones/boundaries in different colors. It’s also capable of immediately printing a report of students, bus stops, routes and streets located inside a newly created school zone/boundary. 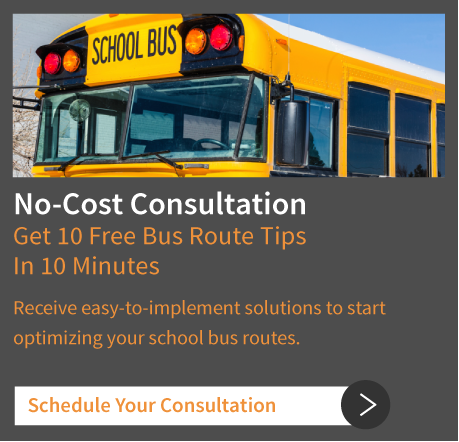 With the BusBoss Report Generator, there’s almost no end to the ways in which you may view accurate, real-time data to discover transportation management solutions for your school district. By way of flexible, customized reporting, you open up avenues for cost saving routes you’ve yet to travel down.